‘Prana’ refers to the universal life force and ‘ayama’ means to regulate or lengthen. Prana is the vital energy needed by our physical and subtle layers, without which the body would perish. FAQ-1. What is Pranayama ? Pranayama is the essence of two words combined, 'Prana' - which means 'vital energy' and 'yama' which means 'self-control.' Pranayama, one of the eight limbs[Ashttanga]of Pathanjali's Yoga sutras enables you to expand the basic life principle[vital energy, latent potentialities] by regulating and controlling breathing patterns. Meditation is described as continued or extended thought, reflection or contemplation. Pranayama is known as a type of yogic breath awareness and regulation exercise designed to help control one's vital energy. FAQ-2. Where did Pranayama come from ? Pranayama is like any discovery of science. It has been rediscovered countless times and taught cross-culturally. The techniques of pranayama were known to many ancient civilizations. However, since only India has survived the passage of time, pranayama has been given an Indian bent as is referred to with a Sanskrit word. FAQ-3. What are the three stages of yoga breathing process ? 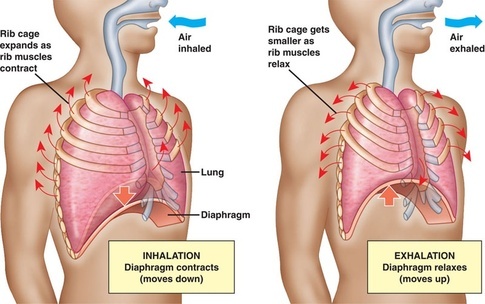 Unless otherwise specified, generally the ratio between inhalation, retention and exhalation is 1:4:2. FAQ-4. What are the different types of pranayama ? Following is the list of Pranayamas. FAQ-5. Can Pranayama be performed in a standing position ? All the Pranayamas are to be done sitting down or sitting on a chair. The back should be straight. There is a lot of mis-understanding and confusion about pranayam, people are taking it to be just another physical exercise. Pranayam works on the subtle 'Energy Body' prana which permiates in our whole of being, which moves every thing in our physical body , mental body , energy body , wisdom body and leads us to see our true self blissful body. When we do these pranayamas it changes our energy level and we start to vibrate at a higher level, our eyes close,our thougts get single pointed and we get disconnected from our senses and takes us inwards, so now if we do these pranayams standing up and get to a state described above we will fall and hurt our selves. Pranayam is NOT an exercise but a way of life , which leads to meditation. FAQ-6. What is the ideal posture for doing Pranayama ? For doing pranayama you can sit in Padmasana , Siddha Asana , Vajra Asana or Sukhasana. If you cannot sit comfortably in any of these poses, sit on a chair. While in sitting pose, keep your backbone straight and head in line with it. FAQ-7. How long should pranayama be done ? Bhastrika Pranayama : Practice this for 25 exhalations, rest for 30 seconds and repeat twice. Kapal Bhati Pranayama : Practice this for 40 exhalations, rest for one minute and repeat twice or thrice. Any time you feel uncomfortable stop. Anulom vilom Pranayama : Practice for 10 minutes. Do 10 sets and repeat twice or thrice. You can increase the duration of alom vilom up to 30 minutes if you have time and feel comfortable. Bharamari Pranayama : Practice 4 times. Agnisar Pranayama : Practice 3 to 4 times. This pranayama is prohibited for heart patients, people with high blood pressure and those who have undergone abdomen surgery. In Hot Weather Chandrabhedna : Practice 10 breaths, repeat once. If you have low blood pressure do not attempt this. Also do not do this pranayama in winters. Sheetali: Practice 5 breaths, repeat twice. In Cold Weather Suryabhedi : Practice 10 breaths, repeat once. If you have high blood pressure do not attempt this. Do not do this pranayama in summer season. FAQ-8. Can Pranayama be practiced even when bowels are not cleared ? An empty stomach is ideal for pranayama. Early morning, food consumed during previous day is digested. It is recommended that you should clear your bowels before starting asanas or pranayama. If you are able to clear your bowels once in 24 hours, it is considered normal. If it is not possible, you can carry on with pranayama. Preferably with regular practice your digestion and constipation will improve. FAQ-9. Can Pranayama be practiced immediately after meals ? FAQ-10. What are the health benefits of pranayama? Pranayama can work wonders in improving the overall health and the function of all the organs in the body.It improves your blood circulation, is very good for heart and improves your mental health (provides peace of mind).